Point-of-care ultrasound is fast becoming a key instrumental technique in nephrology, supporting diagnostics and improving delivery of renal replacement therapy and subsequent vascular monitoring. Here are the top 9 reasons why nephrologists can't afford to ignore ultrasound-guided procedures and applications. 1. Kidney and urinary tract scans provide information about size, shape and echogenicity, as well as an opportunity to identify hydronephrosis. 2. Patients with chronic kidney disease are often at risk of cardiovascular complications, such as left ventricular hypertrophy. 3. CKD patients are also prone to pulmonary congestion. The Bedside Lung Ultrasound in Emergency (BLUE) protocol effectively help identify A-lines and B-lines, with the latter reflecting an accumulation of fluid in the lungs. 4. In hemodialysis, ultrasound is critical to mapping blood vessels and identifying suitable fistula sites, which depend on the individual patient’s anatomy and the quality of the vessels themselves. Post-operative scanning of the fistula helps determine that the flow volume is adequate – the optimal flow is between 400- 600 millilitres per minute or greater – and that the diameter and depth of a fistula are suitable for dialysis. 5. In addition to patient assessment, ultrasound scans are invaluable to renal replacement therapy, guiding needle insertion during biopsies to offer increased accuracy and fewer complications. 6. Ultrasound continues to be an incredibly useful tool for central venous catheter placement. Traditionally, an external-landmark technique is used to assess the position of the internal jugular vein (IJV), which can place some patients at risk of a puncture. Using ultrasound, we can assess the positions and sizes of the IJV and common carotid artery, allowing for a safely guided insertion of the catheter. 7. Balancing fluid volume is important during hemodialysis treatment, preventing both hyper- and hypovolemia in patients, and fluid removal during dialysis is often prescribed in line with a patient’s ‘dry weight’. This clinical estimation often correlates poorly with the true blood volume, and a more reliable indicator of intravascular volume can be obtained by scanning the diameter of the inferior vena cava. 8. For peritoneal dialysis, ultrasound helps to determine the thickest portion of the rectus abdominis muscle for implantation of the inner cuff, and ensures that there are no intestinal loops under the site. 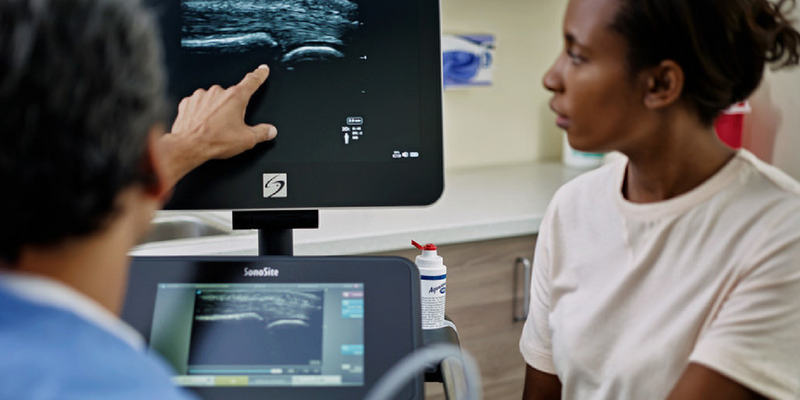 Following location of a suitable entry site with colour Doppler, the introducer needle is inserted and guided by ultrasound, with subsequent scanning to confirm free flow of the fluid. 9. Following CAPD insertion, ultrasound supports early diagnosis of infection with tunnel involvement by locating and measuring any sonolucent pericatheter fluid, as well as assessing a patient’s response to antibiotic treatment. Ultrasound continues to establish itself as a useful tool for nephrologists, offering assistance across a variety of applications, and helping to deliver improved patient care. On Demand Presentation / Dianne DuToit, Clinical Nurse Consultant in Dialysis and Vascular Access, presents "Dialysis Vascular Access Flow Volume." In this webinar, Dianne describes blood flow volume monitoring and benefits, reviews ultrasound anatomy and arteriovenous fistula (AVF) and arteriovenous graft (AVG), discusses ultrasound volume flow monitoring, describes the equipment and software used, reviews colour and pulse wave Doppler, outlines how to perform volume flow calculations, and discusses results and clinical pearls. SonoSite's portable ultrasound machines are intuitive, durable, and backed by a 5-year warranty. Learn how our machines undergo rigorous durability testing, hours of quality assurance, and are designed with clinicians from the ground up.